The Italian “brain drain” phenomenon is increasingly coming under the international spotlight, as it highlights many of Italy’s huge structural flaws. It is estimated that around 200.000 Italians leave the country every year, although official statistics put the number at only 78.000 (latest update: 2012, source: Aire). Around half of them are people in their 20s or 30s, the most productive and innovative part of the society. The surge of Italian expatriates in 2012 has been the highest in decades: +30%, in comparison with 2011. Why do they emigrate? Italy is a country ruled by old people, where it is very difficult to find someone under 40 years of age in a top-level positition. The value of the merit is largely disregarded: only people with the good “connections” go forward. It doesn’t help to have a good CV, or an international profile: corporative interests and family relations come before anything else. A sort of “mafia-society” (very well spread all over the country), which is heavily contributing to Italy’s decline. On top of that, salaries for young people are under the EU average, the recruitment mechanism is mostly unprofessional (95% of the companies are SMEs, they normally haven’t a dedicated recruitment team), the career path is often discretional and not based on results, while the Welfare State for young unemployed is practically non-existent. All this makes Italy a country below the common European standards. “No country for young people”, it is often said. And a country in decline, with one of the lowest growth rates in the EU. 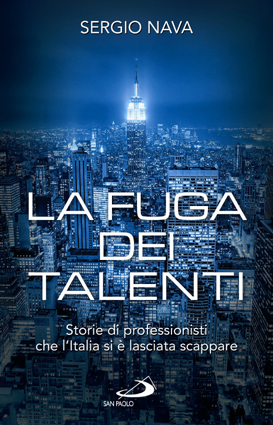 “La Fuga dei Talenti“, a book by Sergio Nava published in 2009, is a crude exposé of this appalling situation: a unique collection of stories of young Italian expatriates, who were able to restart their life as soon as they left the country. The book turned immediately into a blog (https://fugadeitalenti.wordpress.com), and later into a radio show (“Giovani Talenti“), on air every Saturday on Radio 24. Strano che nessuno abbia ancora commentato . Comunue mi chiamo Matteo , ieri sera ero a Castlefranco Veneto per il meeting organizzato dal lions club sulla fuga dei talenti . Ho avuto il piacere di sentirla , sentire le opinioni e le testimonianze dei pubblico e invitati. Volevo parlare ma alla fine ho lasciato stare perchè sono ” troppo loquace ” a volte ( infatti mi sono trattenuto con la mia amica una buona mezz’oretta insieme con la ragazza proveniente da Londra in cinta invitata a testimoniare la fuga dal nostro paese ) . Condivido pienamente il suo punto di vista , non solo per quanto riguarda giovani laureati o uomini oramai , ma di tutti i talenti , per quelle persone che vogliono qualcosa in più dalla loro vita e che combatteranno per uscire dal buco enorme che si è creato in questo paese come se fosse una voragine in cui gettare il talento e mantenere lo status quo ( marcio ) della nostra società politicizzata che sta sperperando non solo soldi ma TALENTI in quantità industriale .E da giovane trentenne tornato dall’estero dopo una bellissima esperienza lavorativa ora mi ritrovo si , che ho esperienza e intuito , ma COSTO troppo. Diciamoci la verità ; pochissimi investono , soprattutto nelle risorse umane , anche se bisognerebbe ricordarsi che ” LE IDEE ” si pagano , come le persone che valgono ” SI PAGANO . Di certo non vado in cerca di stipendi milionari , ma di certo non di mille euro dopo quello che ho fatto e sacrificato . Quindi sto cercando di ritonare fuori , lontano ( ma anche no ) dove la mia persona sia più valutata.FATE SEMPRE UN ESPERIENZA ALL’ESTERO E SE TORNATE NON SVENDETEVI PER NULLA , PERCHè IL VOSTRO TALENTO è IL VALORE PIù GRANDE CHE AVETE , ma che sia giustamente retribuito e soprattutto se la gavetta ve la siete già sorbita !